Product prices and availability are accurate as of 2019-04-14 04:52:35 EDT and are subject to change. Any price and availability information displayed on http://www.amazon.com/ at the time of purchase will apply to the purchase of this product. In this Roof Design in Revit training course, expert author Brian Myers will teach you how to create a variety of roofs using Revit. This course is designed for the absolute beginner, although a basic understanding of Revit techniques is recommended. 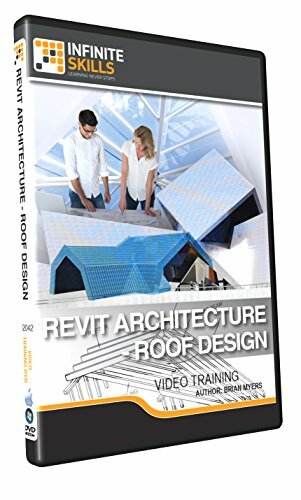 You will start by learning how to create and edit a roof structure, then jump into creating a flat roof. From there, Brian will teach you how to model various roof styles, including a gable roof, shed roof, and saltbox roof. This video tutorial will also cover combined roofs and dormers, including a gazebo roof, and dormer walls and roofs. Finally, you will learn about tile roofs, as well as roof components. Once you have completed this computer based training course, you will be fully capable of creating a variety of traditional roof types using Revit modeling techniques.